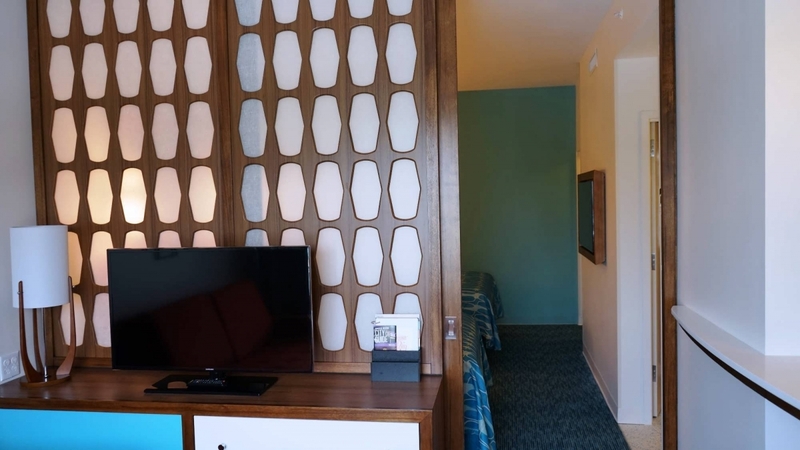 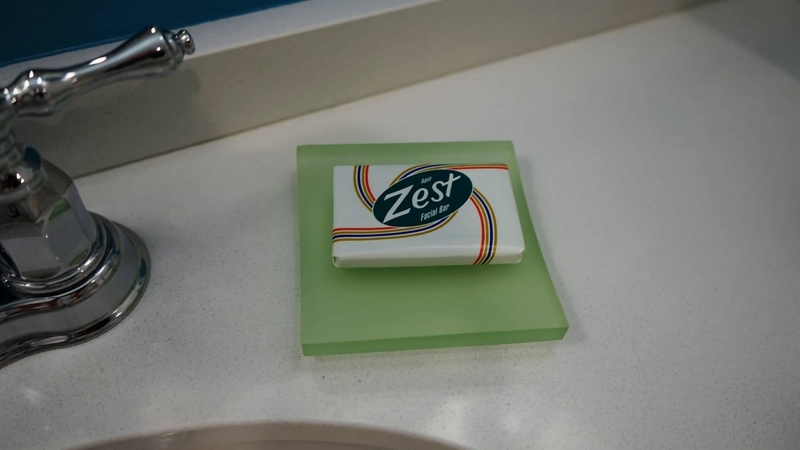 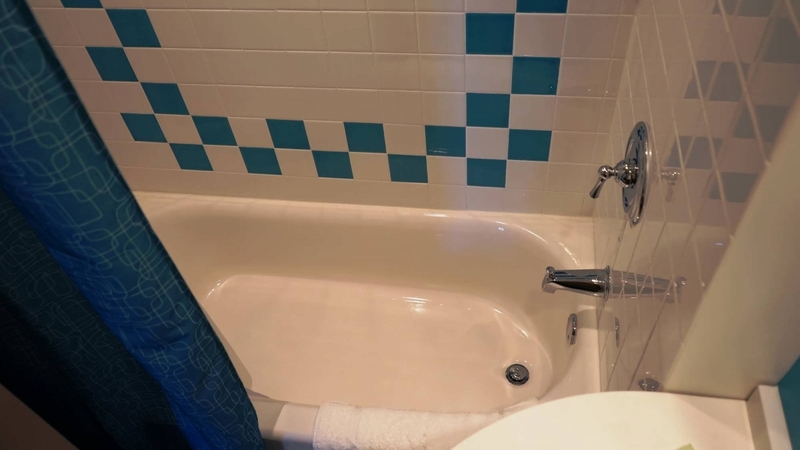 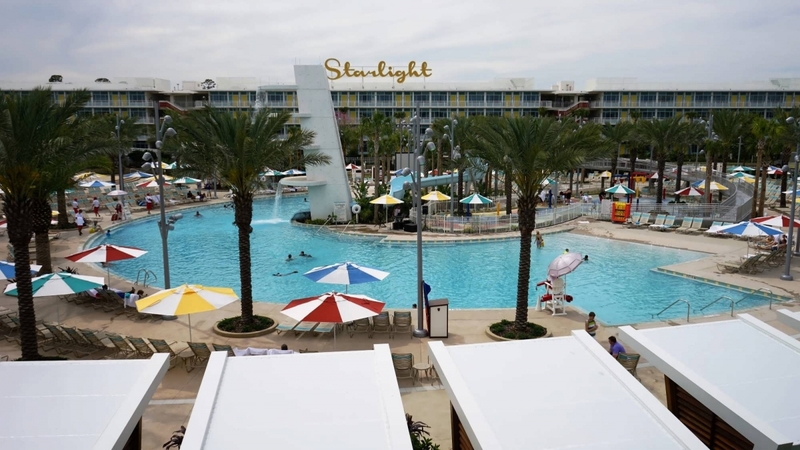 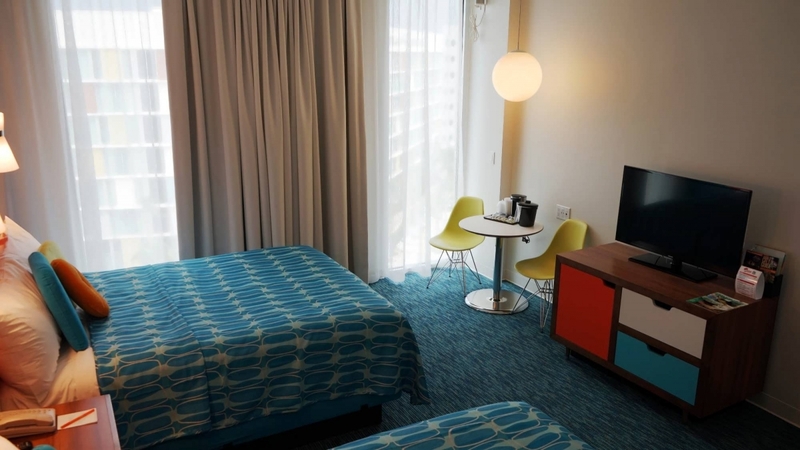 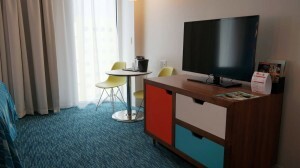 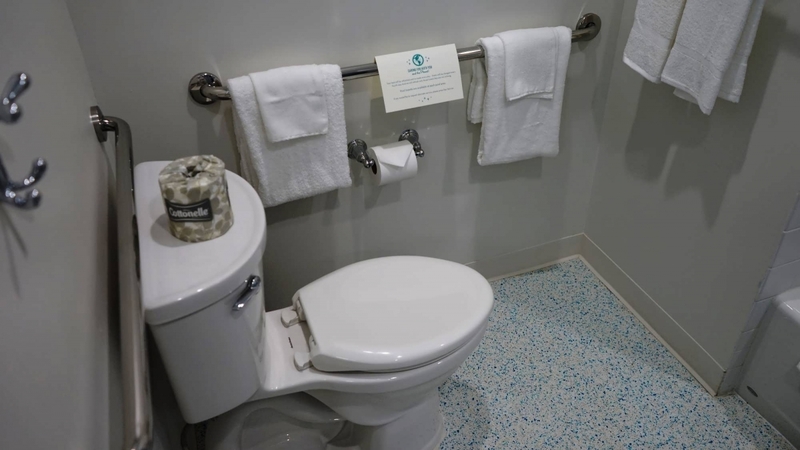 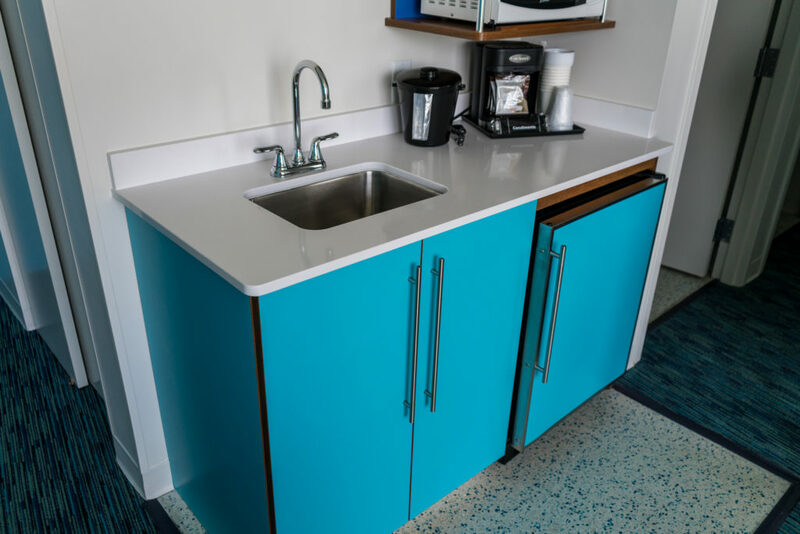 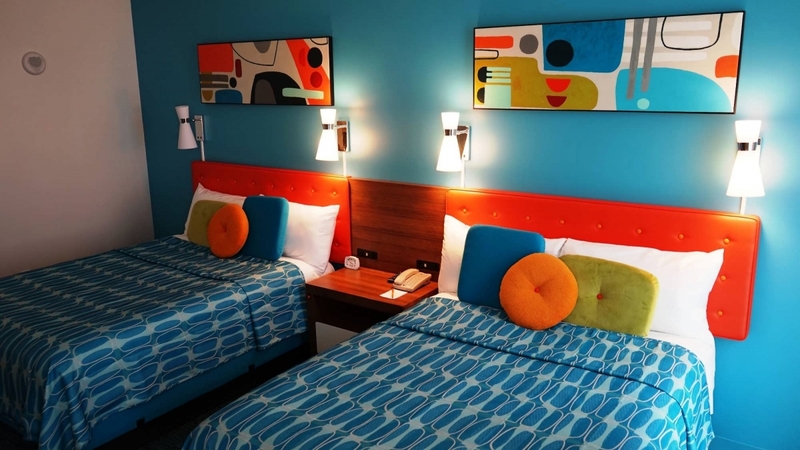 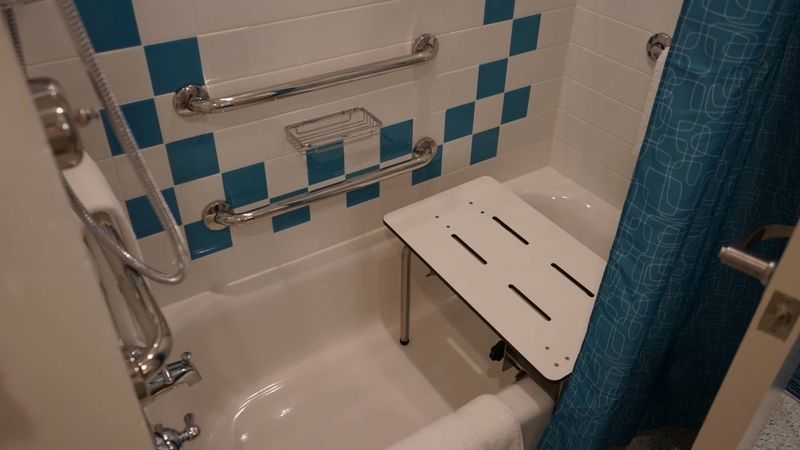 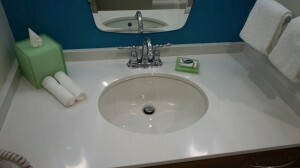 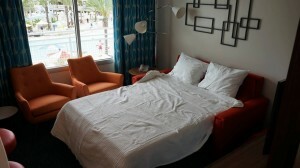 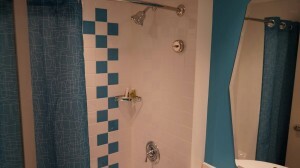 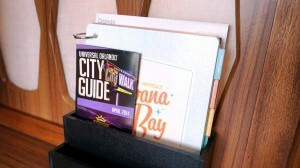 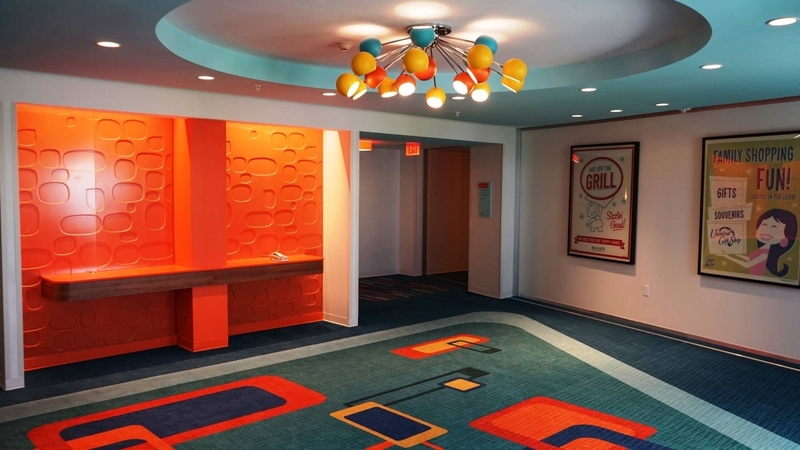 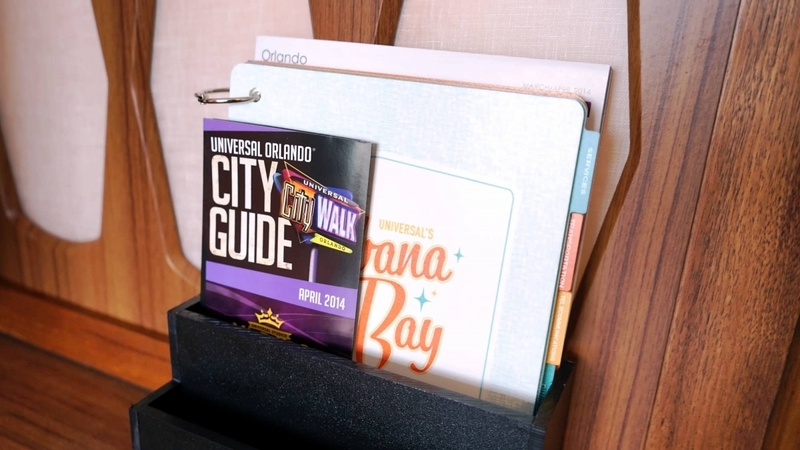 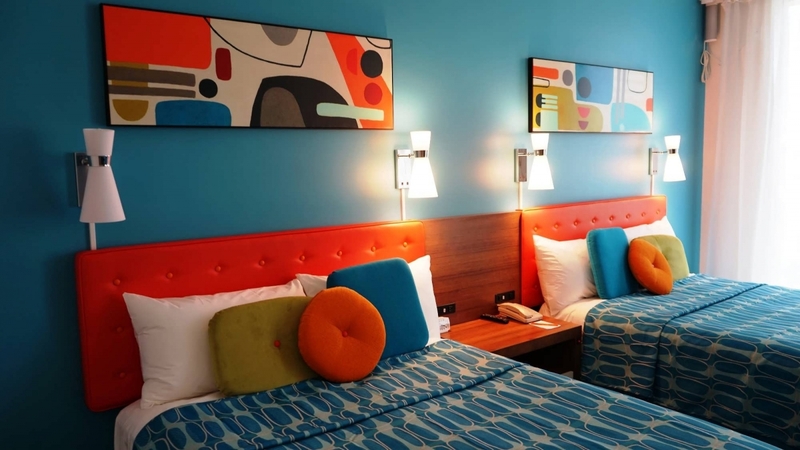 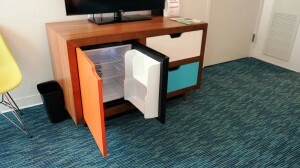 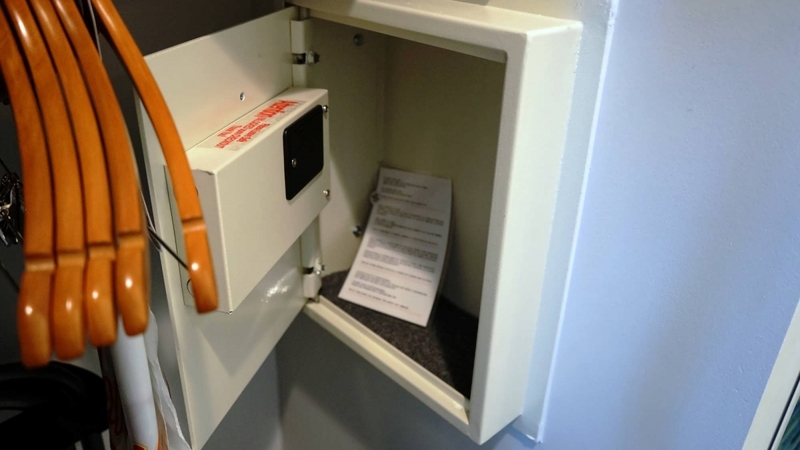 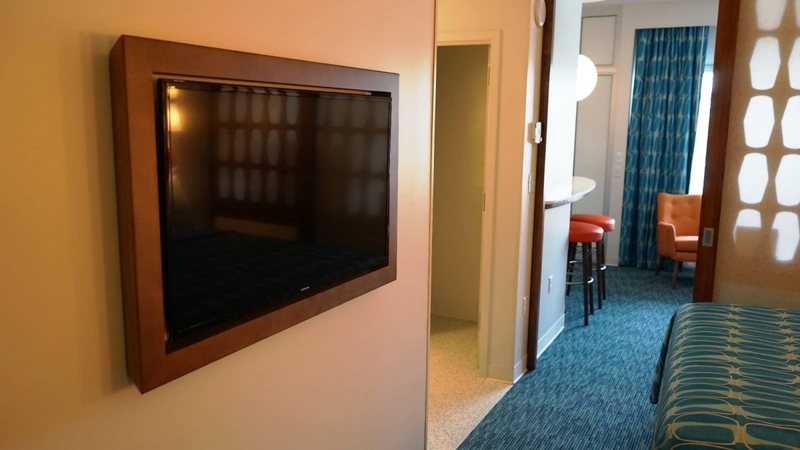 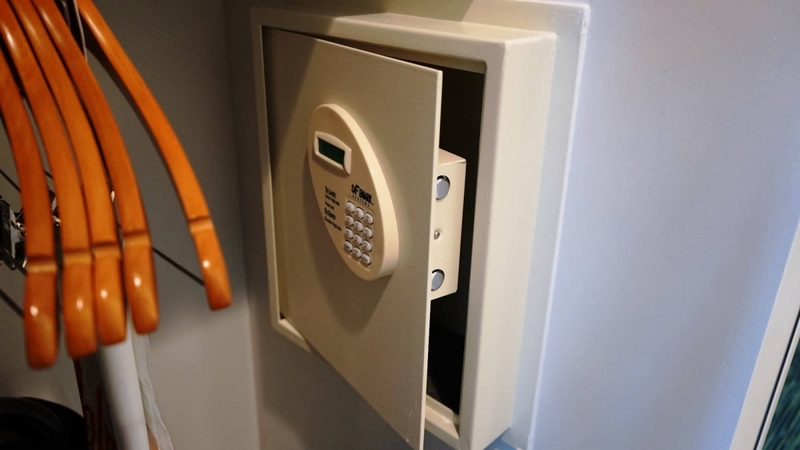 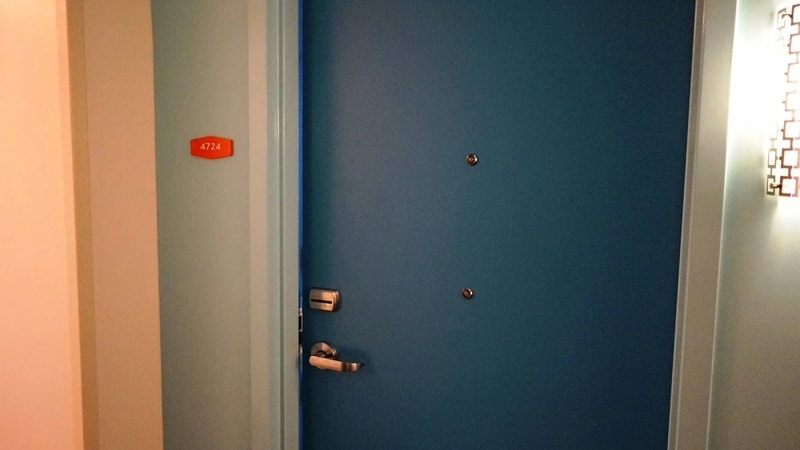 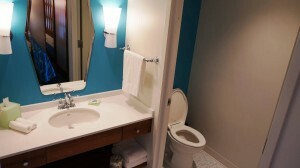 This page includes descriptions and photos of each room type available at Cabana Bay Beach Resort, one of the two prime value hotels on-site at Universal Orlando Resort. 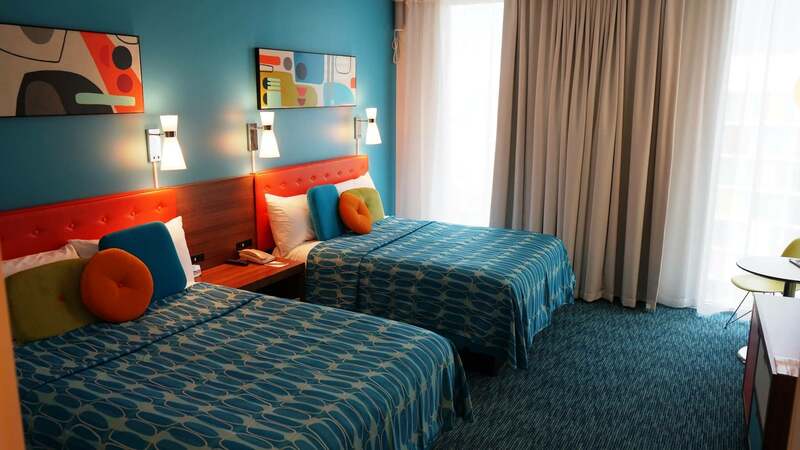 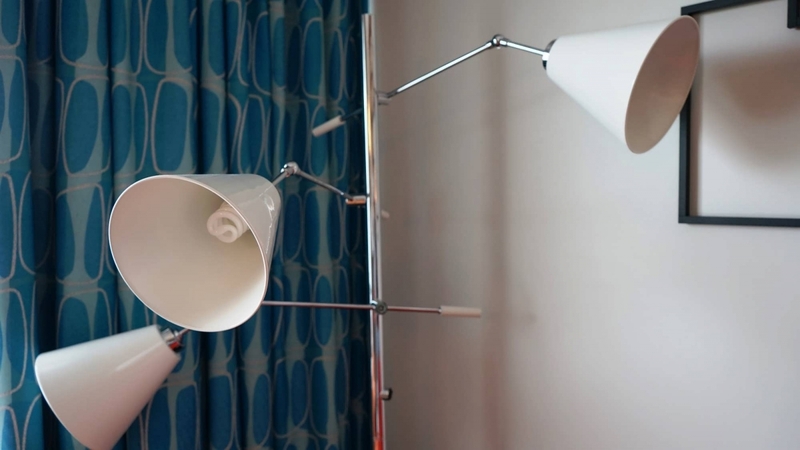 Redefine family time with a stay in one of these affordable suites. 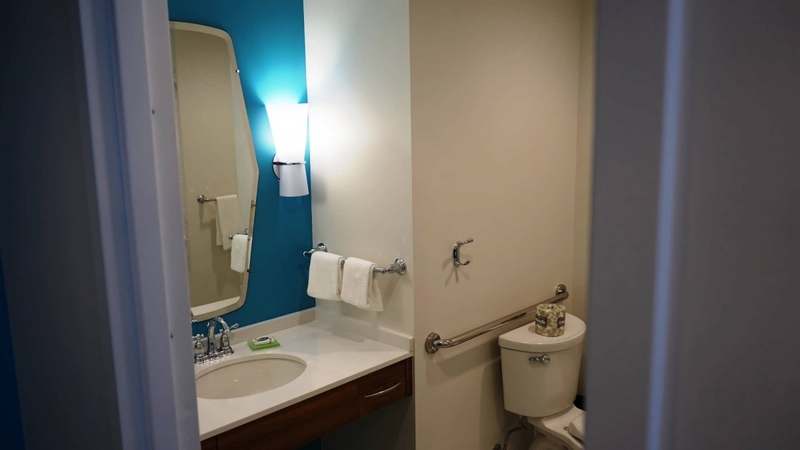 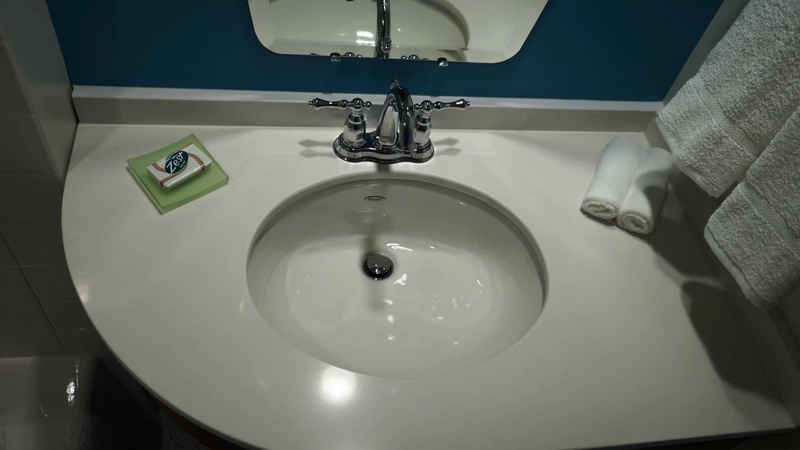 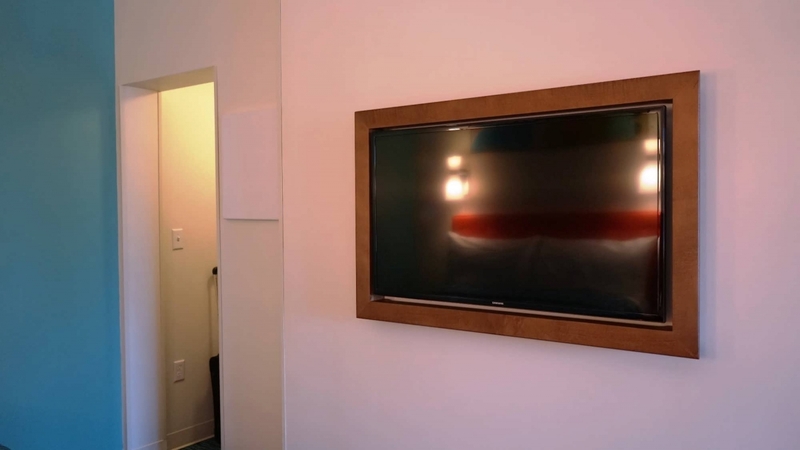 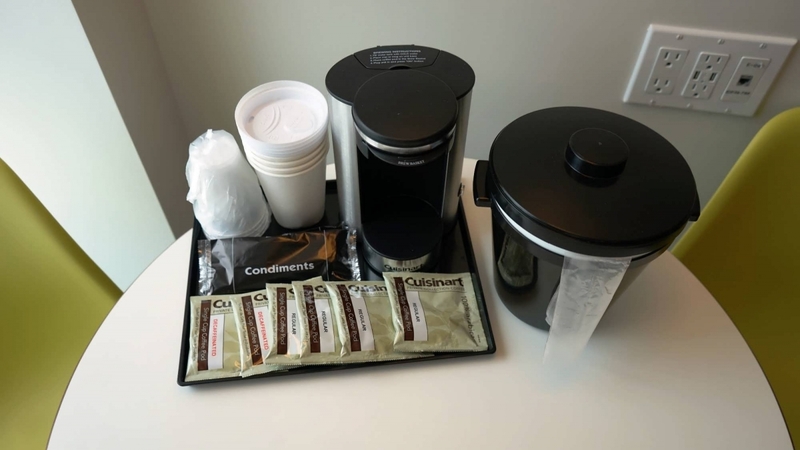 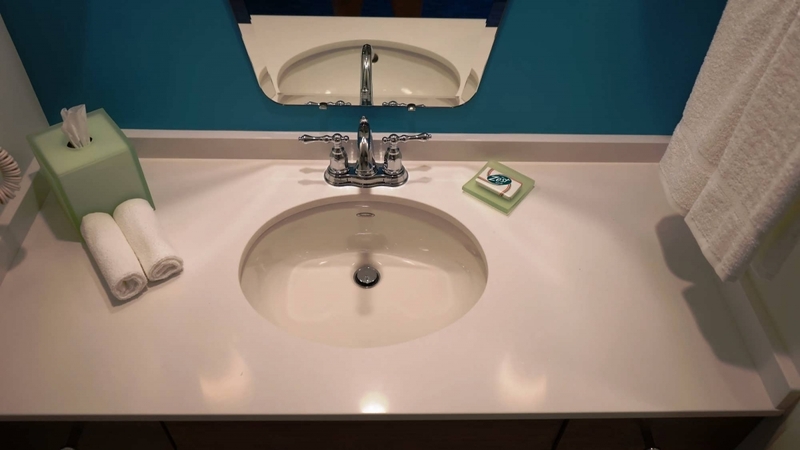 From the two 40” TVs to the convenient kitchenette to the brilliant bathroom area – designed to let three people get ready at once – they give everyone more room to relax. 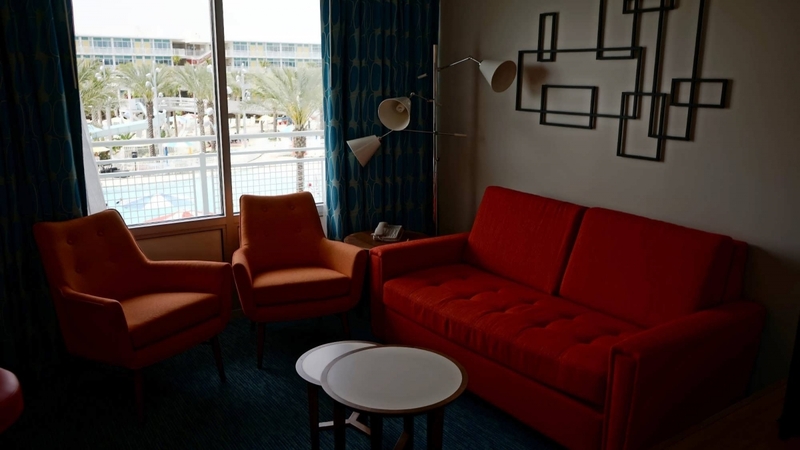 The first section of Cabana Bay to open, the North Courtyard and its 600 family suites are inspired by the sweeping motor courts of the 1950s and ’60s. 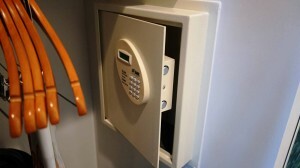 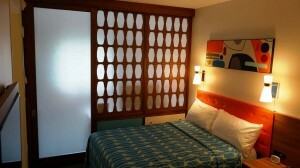 It features four-story buildings with open corridors and direct access to guest rooms. 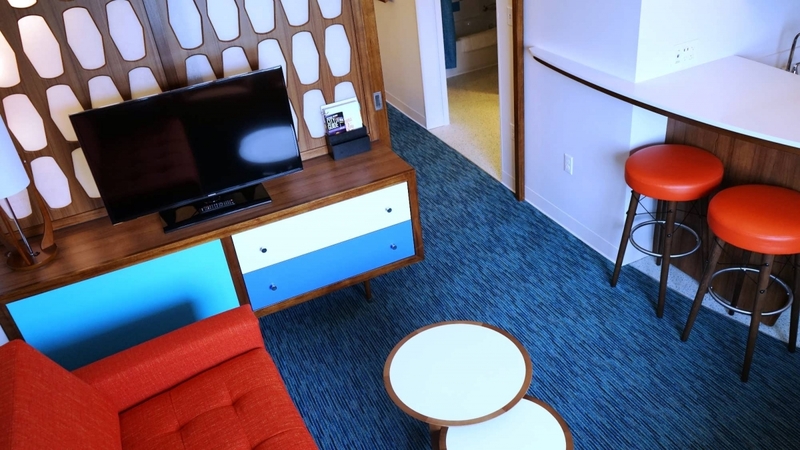 There’s plenty of space for the whole family in the charming family suite. 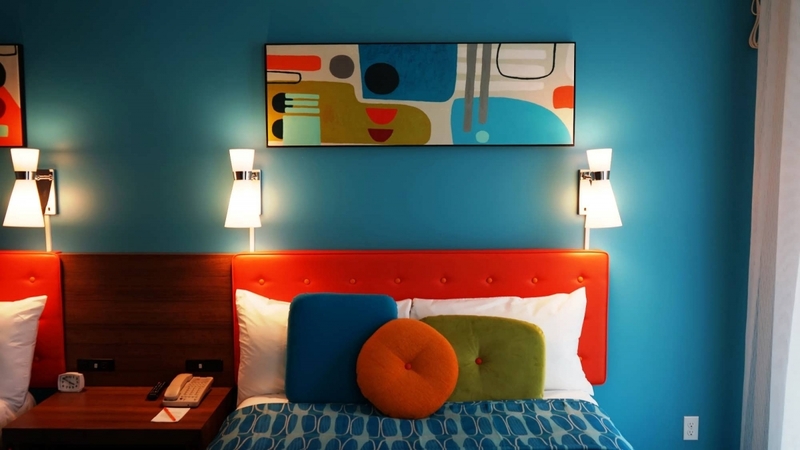 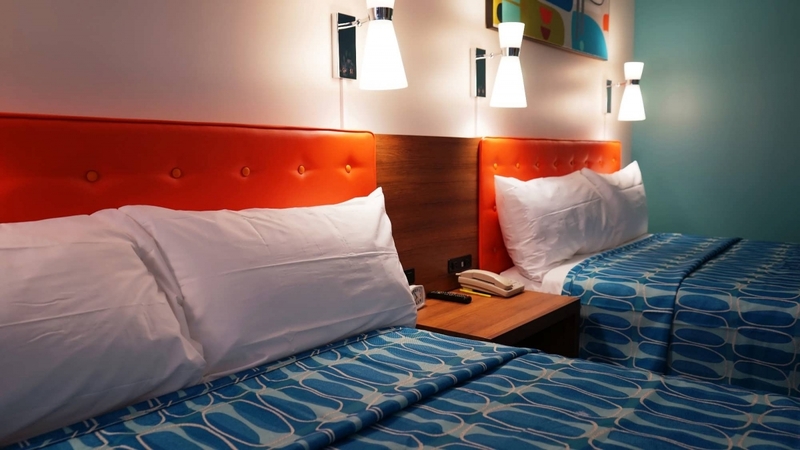 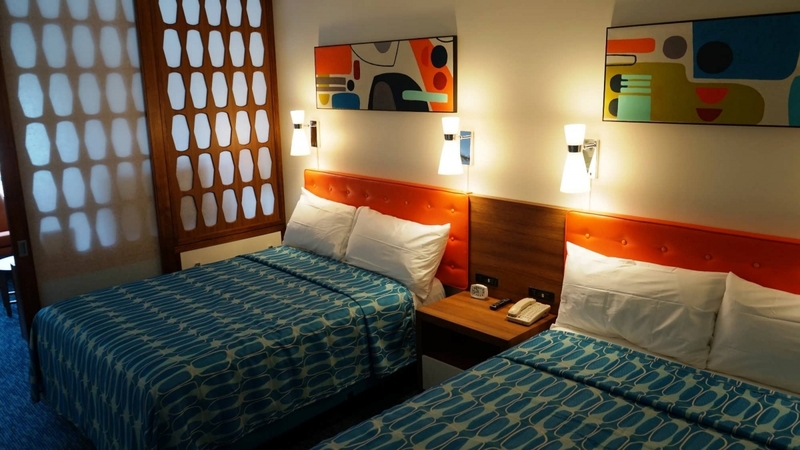 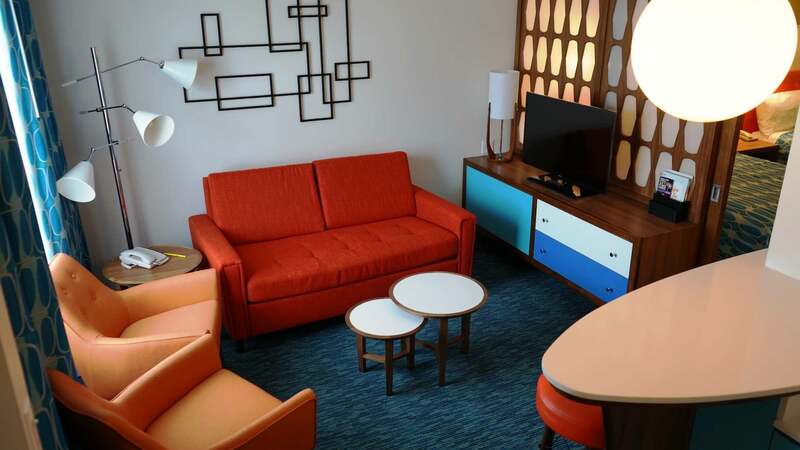 These retro rooms boast colorful decor, sleeping accommodations for six, two flat screen TVs, a kitchenette area, and a sliding partition for privacy. 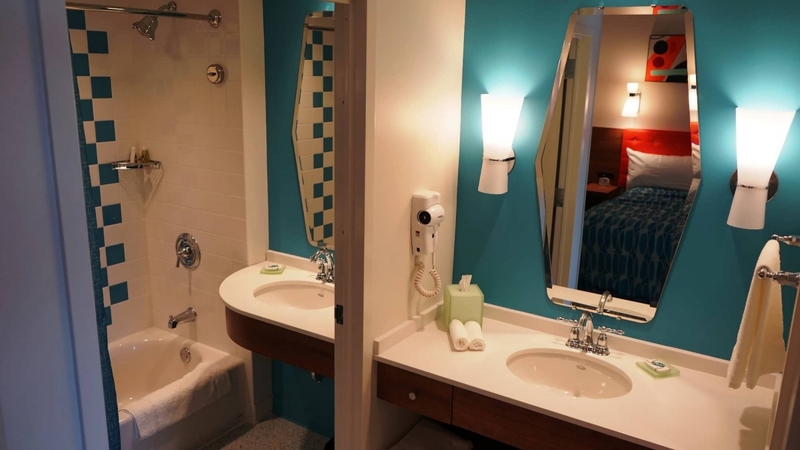 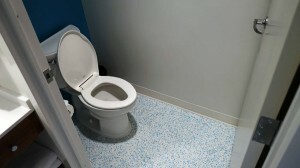 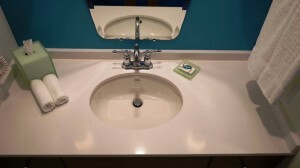 The extra-large bathroom features preparation spaces for three people at once, so everyone can get to the park early. 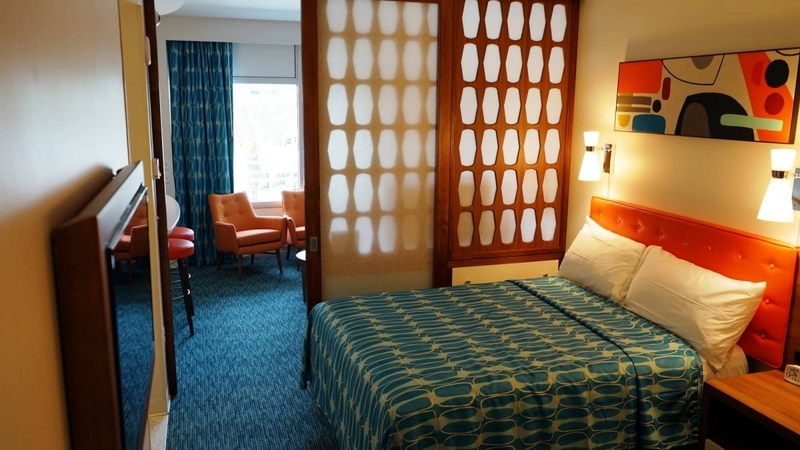 Open the curtains and let the sun shine in! These rooms feature all the comforts of the standard family suites but have the added benefit of opening up directly unto the courtyard and pool area. The South (or Tower) Courtyard is also inspired by the ’50s and ’60s, but with a slightly different feel. 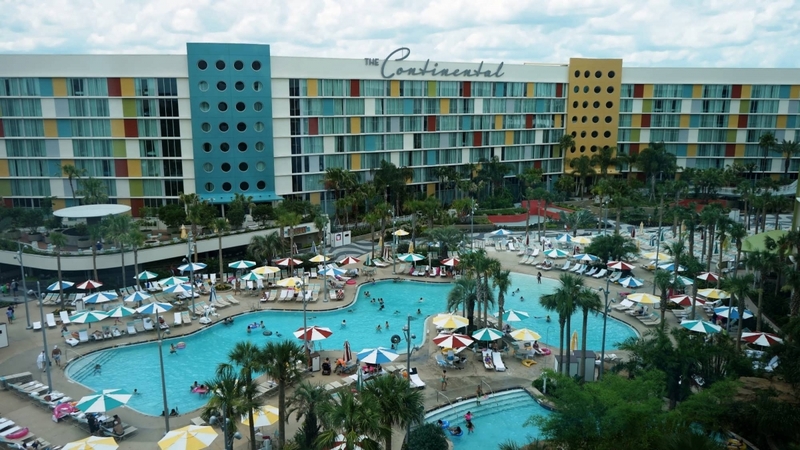 This half of the hotel features a colorful, tropical resort design, with serpentine, seven-story towers flowing like waves around a massive pool and lazy-river complex. The standard rooms in the South Courtyard towers are a great place to shift your vacation into relaxation. 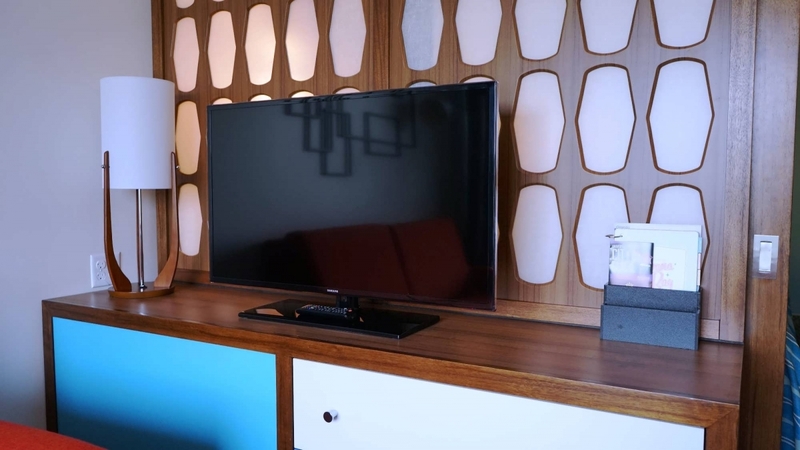 Two queen beds, iconic décor, and a flat-screen TV make your room a private getaway. 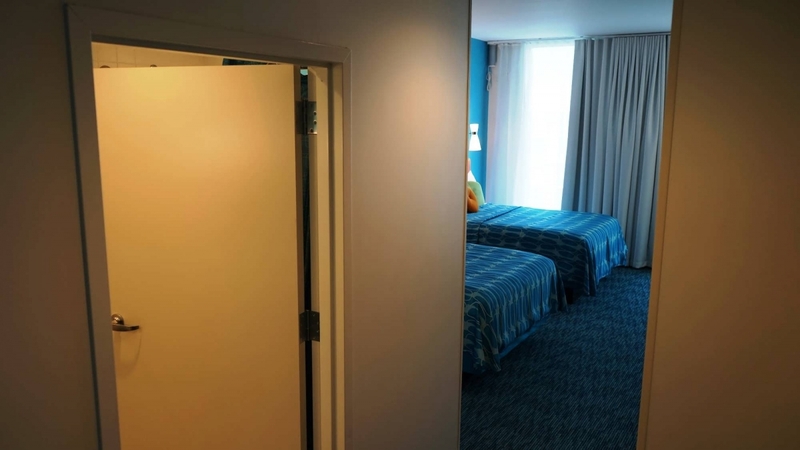 Pull back the curtains to let in the Florida sunshine or pull them tight for a restful night’s sleep before a day in the parks. Open the curtains and enjoy views of the lush foliage surrounding the expansive pool area that leads to the lazy river. Just like the roadside motels of days past, the pool area is always a fun place to be and be seen. 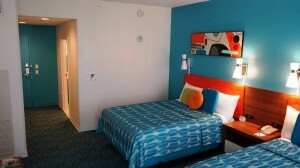 This tower room features two queen beds, iconic décor, and a flat-screen TV to make your room into a private getaway. 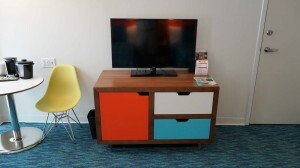 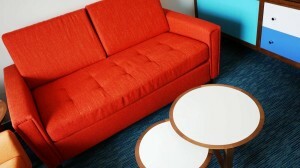 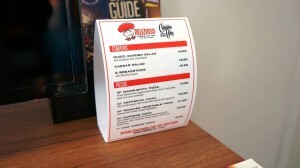 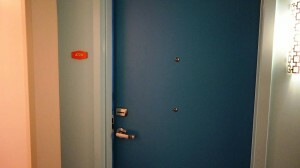 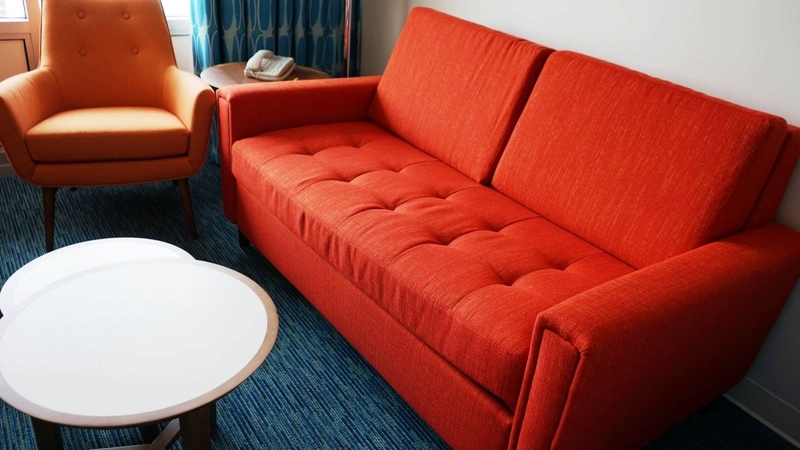 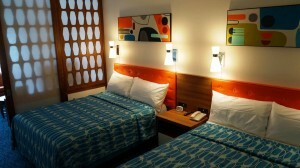 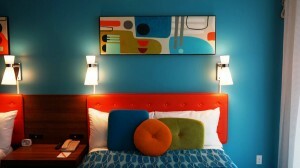 The South Courtyard family suites are exactly the same as the North’s, vibrant colors and all. 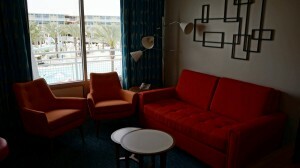 Take in the sunshine along with a picturesque view of the lazy river and pool area from these interior suites. 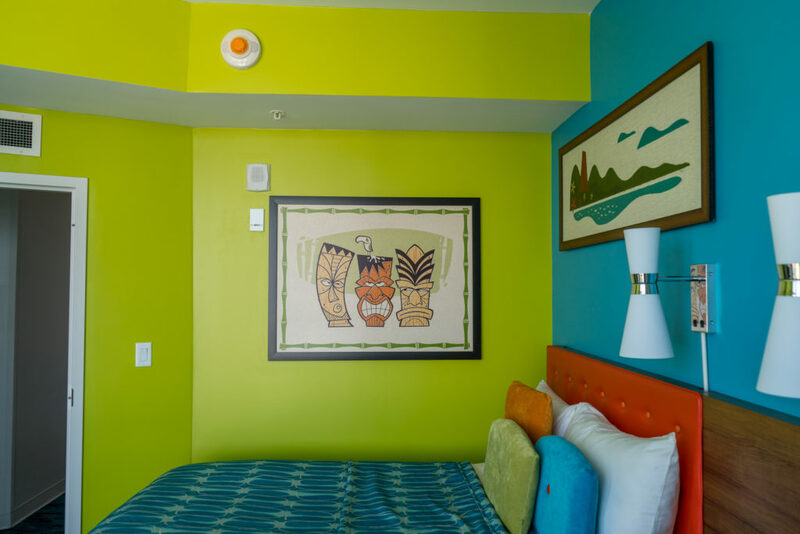 The lush, tropical landscaping makes a scenic backdrop to the quirky, fun design of your room. 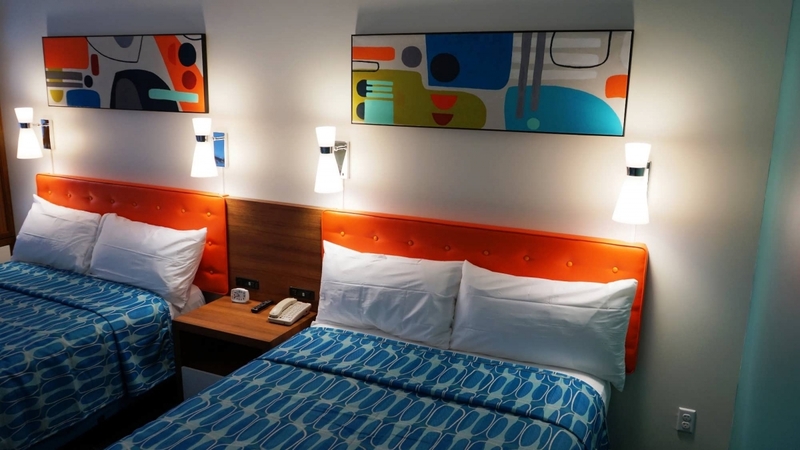 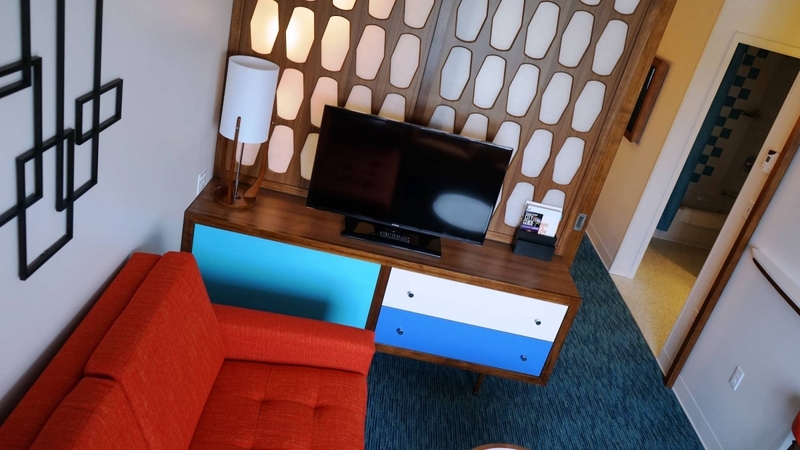 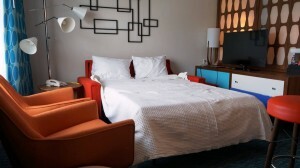 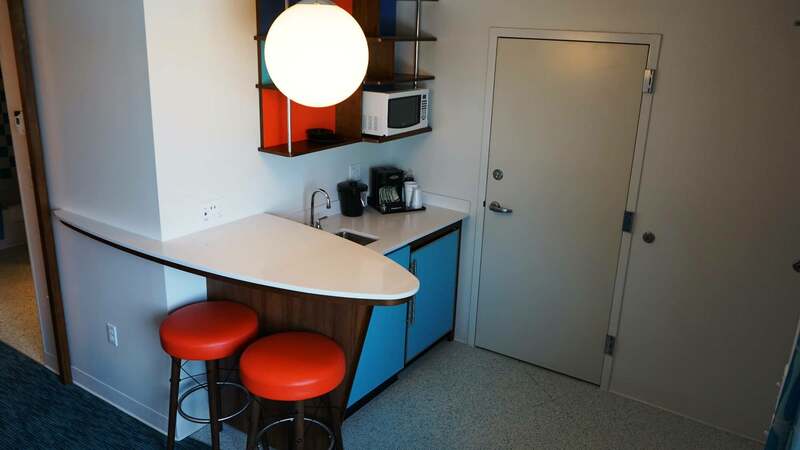 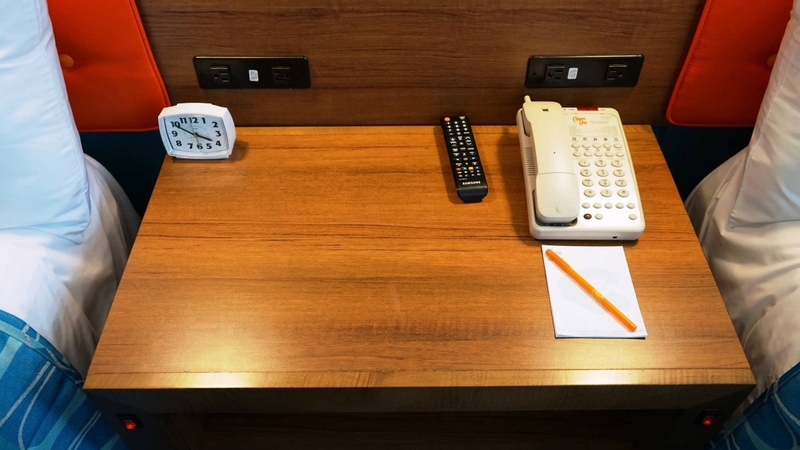 Like the other Tower Suites, these retro rooms boast colorful décor, sleeping accommodations for six, two-flat screen TVs, a kitchenette area, and a sliding partition for privacy. The extra-large bathroom features preparation spaces for three people at once, so everyone can get to the park early. 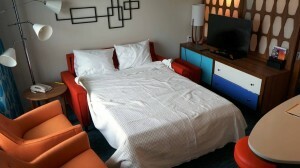 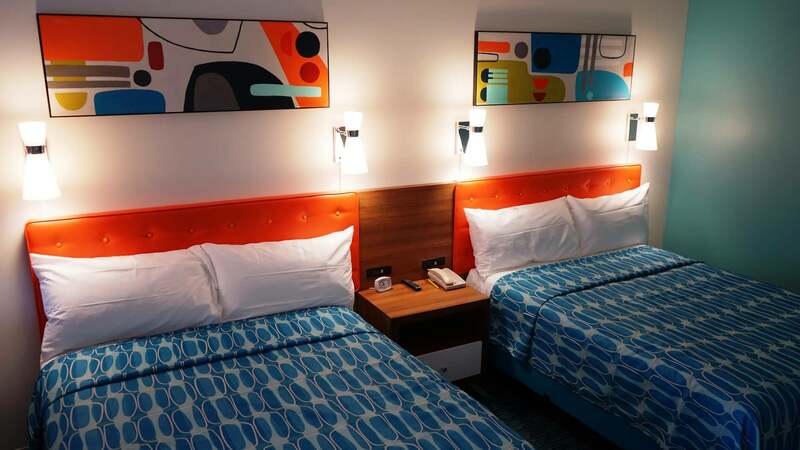 Added with Cabana Bay Beach Resort’s expansion in 2017, the two-bedroom variation of the family suite throws in 342 extra square feet and another bed to sleep a maximum of eight. 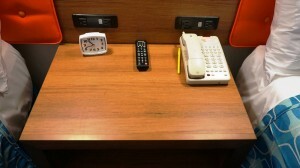 The trade-off? There is only a total of 20(!) 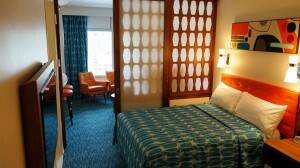 of this room type available (located exclusively in Cabana’s two new towers). 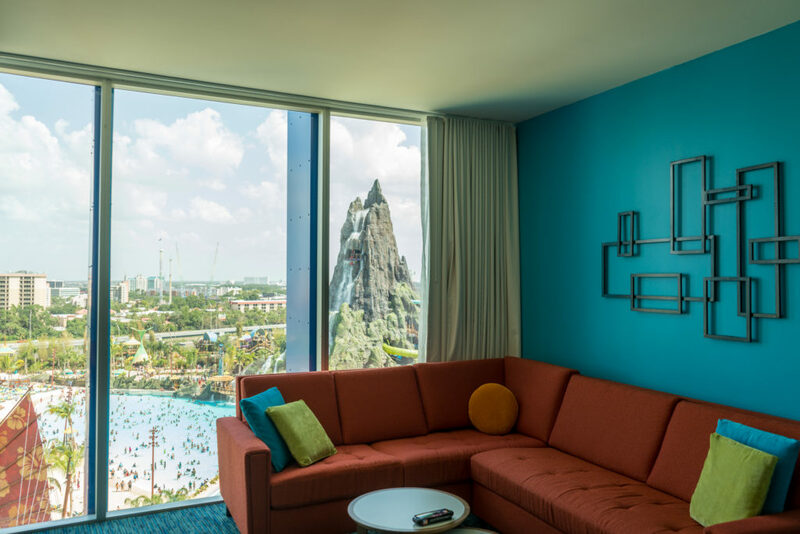 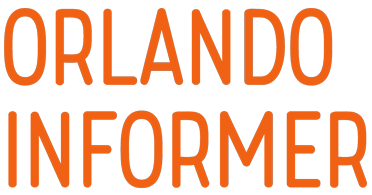 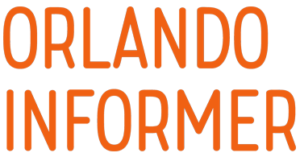 For an extra treat, be sure to request the Volcano Side room, which has a breathtaking view of the Volcano Bay water theme park.